Just copy that and paste one of those into your signature. Or write it any way you like! Try out putting a frame on your profile pic that shows that you’re an ordained Dudeist Priest! Banners for your site/blog, etc. Want to put a banner on your website or myspace page that links to us? Just copy the blue code below the banner you want and paste it into your html code. 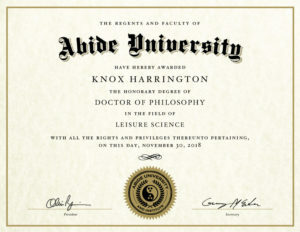 <a href="https://www.dudeism.com" target="_blank"><img alt="Get Ordained as a Dudeist Priest" src="https://www.dudeism.com/Images/get-ordained-for-free-at-dudeism.gif" border="0" title="Get Ordained as a Dudeist Priest" /></a> Thankee. We’ll have more designs soon.